How will Hayden Moore follow his record-breaking performance? Having Miami’s Brad Kaaya and Cincinnati’s Gunner Kiel lead their respective offenses on Thursday night would have certainly qualified as an enticing matchup of quarterbacks. Kaaya and Hayden Moore might be equally enticing. Moore — a freshman who came off the bench and threw for a school-record 557 yards and four touchdowns last week after Kiel got hurt — will be the starter when the Bearcats (2-2) play host to Kaaya and the Hurricanes (3-0) in a nationally televised matchup. "I don’t think I’ve ever seen a performance like that. … He broke our record here and we’ve had some quarterbacks that could really throw the football," Cincinnati coach Tommy Tuberville said. "And he did it in three quarters." Facing Moore instead of Kiel doesn’t change Miami’s opinion of Cincinnati’s offense, which has averaged 622 yards per game so far — the third-best clip among all FBS teams. The Hurricanes are fully aware that a high-octane challenge awaits. "Our guys know," Miami coach Al Golden said. "We played them last year. We know they can score quickly and can score in bunches. It’s going to be another rock and roll game. They’re going to go fast and we’ve got to be ready." Kaaya has thrown a touchdown pass in all 16 of his games as a Hurricane, and is facing a Cincinnati defense that has allowed 1,018 yards in the last two weeks alone. In last season’s 55-34 Miami win, the Hurricanes racked up 621 yards against the Bearcats. Miami opens Atlantic Coast Conference play next weekend at Florida State. Kaaya said there’s no way the Hurricanes will be looking ahead. "Our focus is going to be on beating Cincinnati," he said. To get ready for what it expects to be a raucous Thursday night crowd at Cincinnati’s newly remodeled Nippert Stadium, Miami cranked up the noise at practice this week. The Hurricanes have a booming mobile sound system on their practice field and it worked overtime to get ready for what Miami expects to be a very loud matchup. "A lot of people have been to Nippert before, probably before they spent $80 million on it," Golden said. "Clearly it’s a tight environment and a tough place to play." NEW LOOK `CANES: Yes, Miami’s offense got into the end zone six times against the Bearcats last season — but the people who scored five of those touchdowns are either hurt or in the NFL. Phillip Dorsett (Indianapolis Colts) caught two touchdown passes, Clive Walford (Oakland Raiders) grabbed another, Duke Johnson (Cleveland Browns) ran for one and Gus Edwards (injured, out for season) also scored on the ground. Kaaya ran for a score that day and LB Tyriq McCord ran an interception back for a score in the Hurricanes’ easy win. THE SERIES: It’s the 13th matchup between Miami and Cincinnati. The Bearcats won the first one, back in 1947. Miami has won each of the last 11 in the series. LONG GAME AHEAD? College games with plenty of passes and tons of offense — as this one figures to have — don’t tend to move along quickly. Oddly, that might favor Miami. All three of the Hurricanes’ games so far this season have lasted more than 4 hours, though two of those were extended by lightning delays. Per the NCAA, the Hurricanes’ games have averaged 4 hours, 18 minutes this year, the most of any FBS team. 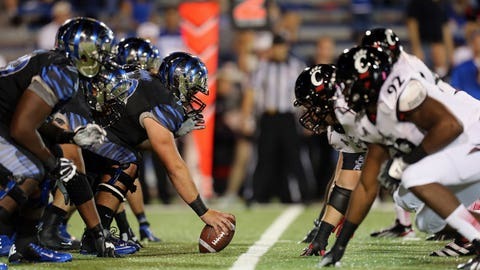 TOUGH AT NIPPERT: Cincinnati has won 27 consecutive non-conference games at Nippert Stadium. The last time the Bearcats lost in their own facility to a nonconference team was 2002, against Miami — that is, Miami of Ohio. SHORTHANDED FOR A HALF: Miami’s pass defense has been shaky at times this season, especially when Florida Atlantic and Nebraska were playing at a quick pace. The Hurricanes expect the Bearcats will play the same way, and further complicating matters on that front for Miami is that safeties Deon Bush and Jamal Carter will be suspended until the second half because of targeting penalties they received late in the win over the Cornhuskers.